New Zealand's famous cold sweet dessert. This dessert is in competition with Australia, because Australia believes' they were first. They were not, in 1999 there was a program on TV tracking back to where it originated. 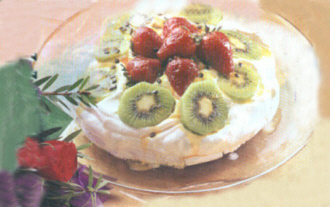 turn off the oven, when you have placed the pavlova into the oven. Beat the egg whites until resembles whipped cream. Add tsp of malt vinegar. Fold in dessertspoon corn flour. 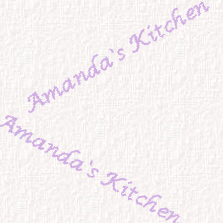 Onto a pre-non stick or greased flat cookware dish or oven tray (sheet). Pile the whipped mixture intoa mound about the size of a bread and butter plate. Place into the oven and let it cook for 1 hour to 1 1/2 hours. The outside has just turned a light golden brown. Take out of the oven. The texture is dry and crisp on the outside. or fruit salad than eating just on its own. Finely crush biscuits - Combine biscuits and butter and line pie base. Combine jelly with boiling water and mix until dissolved. Beat cream cheese until soft and add sour cream, beat together until well combined. Add vanilla and jelly mixture and blend in. Pour filling into the prepared base.